Robert Lewandowski finished as the Champions League group stage's top scorer, interrupting the duopoly enjoyed by Lionel Messi and Cristiano Ronaldo. 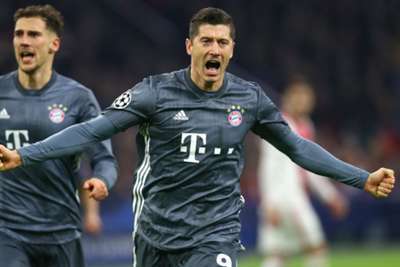 Lewandowski's double in Bayern Munich's thrilling 3-3 draw at Ajax, which secured top spot in Group E for the Bundesliga champions, took his tally for the competition to eight, two more than Barcelona star Messi. It marks only the second time since 2010-11 that neither Ronaldo nor Messi has topped the scoring charts at the end of the group stage, Luiz Adriano having found the net nine times in 2014-15. Lewandowski is joint-second in the list of Bundesliga top scorers this season, one behind Borussia Dortmund talisman Paco Alcacer and Eintracht Frankfurt's Luka Jovic.